Jeremy Camp has a brand new album coming out on October 6th, titled The Answer and will be hitting the road on tour. I had the opportunity (excitedly I admit as I am a huge fan) to listen to the CD before its release. The CD did not disappoint that is for sure. After being in the industry 15 years, Jeremy has won many awards. He has had albums and songs top the charts and this one I am sure will be no exception. 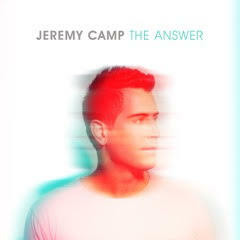 Multiple award-winning and GRAMMY® nominee artist JEREMY CAMP releases his new studio album, The Answer, on October 6. Promoting his new album, Jeremy will be headlining The Answer Tour. The complete list of tour dates are listed, and tickets are on sale today at jeremycamp.com. I will say that after listening to his new album, repeatedly over that past few days. There are sure some songs that will be favorites of mine. Camp, like on many other albums of his shines through with his diverse talents. Ballads like The Answer and Never Stopped Loving Me, he is known for. His powerful vocals on songs like My Defender, Heaven’s Shore and his deep raspy vocals on Awake O Sleeper. Like many times before I am blessed to be able to offer the opportunity for one of my readers to win a copy of Jeremy Camp’s new album The Answer. Enter below and you might just be the proud owner of your own CD from Capitol Records to add to your collection. “He Knows” has always been my favorite Jeremy Camp song but I love “Awake O Sleeper” now too. “Same Power” is my favorite song by Mr. Camp.